"Abraham believed God, and it was credited to him as righteousness." If I put my name in there, does it still work? Romans 4 talks all about Abraham having faith, and how he was credited as righteous not because of what he DID but because of what he BELIEVED... because of his FAITH. "Faith was credited to Abraham as righteousness." Now, I know Abraham and Sarah (Abram & Sarai) made some not-too-good decisions smack dab in the middle of "Abraham believed God." Decisions that have affected the entire course of the world to today. But, Romans 4 doesn't mention that. It says that because of his belief in God he was credited as righteous. In my trusting and believing and moving forward, I know I've made some decisions and said some things that aren't exactly in line with the path God has for me to walk out. In fact, I almost did it again just this morning. Trying so hard to have wisdom and discernment and make the right decision that I come close to making the wrong one. Or I do just flat out make the wrong one. But, it says that, "Abraham believed God, and it was credited to him as righteousness." Lord, I believe You... I simply believe You. Even amidst my misses and my near-misses, I believe You. I guess I must subconsciously think that believing God will keep me from making some of those stupid human mistakes. Except I'm human... prone to mistakes. So, maybe it's not that believing Him will keep me from all of that stuff. It obviously will keep me from some major stuff, and listening to His voice and direction will keep me walking where I need to walk. But, I'm still going to lose my cool with the kids from time to time. I'm still going to give the wrong response to a friend and have to go back and apologize and go from there. I'm still going to forget to put some things on the calendar and miss the event with no good reason for doing so except my forgetfulness. And I'm still going to face the stuff of this earth and not always have the right attitude. Believing God will help me amidst all of that, but it doesn't always mean I'm going to be immune to all of that. or that I wasn't believing Him. I think instead we just walk out each day WITH that belief... that He is who He says He is and that He will do what He said He will do. And justification by faith is thankfully a whole different ballgame. Because if it were justification by works, I think I'd die under the pressure of each daily mistake I make. 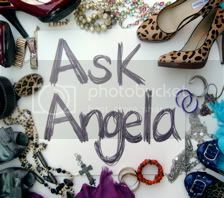 "Angela believed God, and it was credited to her as righteousness." "Faith was credited to Angela as righteousness." Not because of anything I do that makes me righteous, but because of my simple belief in the One Who Is Righteous... my faith in Him to do what He said He will do.